The Ohio Classic Knife Show hopes to build on the momentum of recent knife shows as it holds its annual event today and tomorrow. Both the California Custom Knife Show held this past weekend and the Knifemakers’ Guild Show held last month were successes by a number of accounts, and the Ohio Classic hopes to build off their momentum as well as some of its own. For instance, purveyor/collect Jon Ukman noted of the Cal show, “It was outstanding! I bought about 70 knives—and that is a good show.” Purveyor Dave Stark of Steel Addiction Custom Knives also had words of praise for the Cal show. 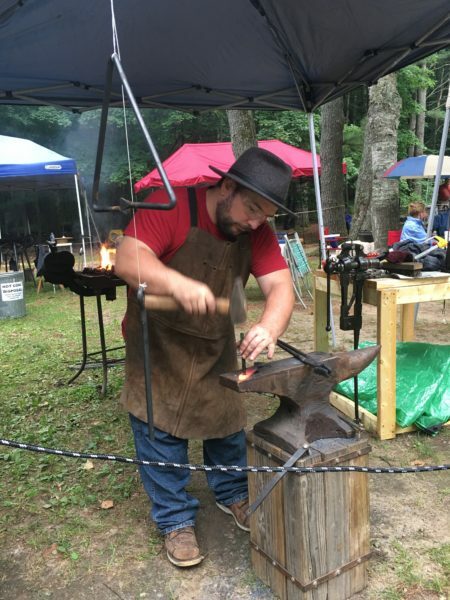 Meanwhile, ABS bladesmith Johnny Perry, who helped display a collection of Bill Moran knives for the Moran Foundation at the Knifemakers’ Guild Show last month, said the Guild Show was a good one as well. Held at the Pritchard-Laughlin Civic Center in Cambridge, Ohio, the Ohio Classic runs from 1 o’clock this afternoon until 7 tonight, and 9 a.m. to 5 p.m. tomorrow. In addition to some of the custom industry’s top makers, the show will include some leading factory knife exhibitors and also a cutting competition tomorrow. In addition, Jeff Fournier from Mule Team Canvas will give a demo on canvas dying. Exhibiting knifemakers include Tom Downing, Blind Horse Knives, Ryan Daniels of Queen Cutlery, Phillip Booth, Wayne Hensley, Pete Crowl, Andrew Demko, George Trout, Mickey Yurco, Greg Gottschalk, W.C. Johnson, James Downs, Thad Yeater, Gary Wheeler, BLADE® field editor Kim Breed, Lon Humphrey, Craig Steketee, Mark Carey of Spartan Blades, Bill Behnke and many others. Also exhibiting will be Charles Turnage of Turnage Productions, photographer Terrill Hoffman, purveyor Jerry Schroeder, Pop’s Knives and Supplies, Brad Vice of Alabama Damascus, Brad Stallsmith of Peters Heat Treat and many others. For more information visit www.ohioknifeshow.com. For the latest knives, knife news and more, keep an edge on it with www.blademag.com (www.blademag.com). The Ohio Classic Knife Show welcomes knifemaker Wayne Hensley (right) and others this afternoon and tomorrow.